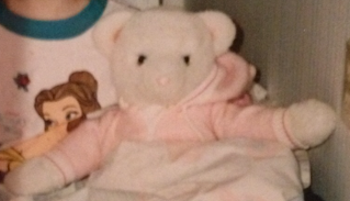 I’m looking for a large white teddy bear with a pink nose, wearing attached pink pajamas with a hood, with fur hands and feet. It’s approximately 25 years old and may be an Eden. The bear was purchased in Vancouver, Canada. My best friend has just lost this favorite teddy bear, Cassie, in a house fire in which everything burned. She literally has nothing left – no clothes, pictures, memories… everything is gone. She was inconsolable about losing this bear, and I know it would mean a lot to her if we could find her a replica. This looks like it may be a Vermont teddy bear. They sell them custom made on their website. They have the 15 inch hoodie-footie bear can be ordered in any color. These bears were sold in the early to mid 80’s. omg I am SOOOO sorry! I have a bear I’ve had since I was born from 1985 or so. I had been searching for years to find out what he possibly could be since his tags have LONG since disintegrated and he is losing most of his fur. I found one SIMILAR it isn’t him but I think it has to be the same exact model but a larger size and it turned out to be an Eden. I found him from this obscure site where this woman sold old toys. I will try and help the search. I know how heartbroken I would be that has always been my biggest fear since i was a baby is losing that bear in a disaster like that. My prayers go out to your friend!